Choosing the best electric bike can be quite a daunting task, given the huge choice on the market right now. This is why I have compiled this list of the best 5 electric bikes you can buy on Amazon in 2019 for you. The choice is based on thorough analysis of the features and reviews as well on the expert opinions of e-bike enthusiasts and professionals. One of the best electric bikes, the Hurbo Folding Bike is actually very reasonably priced and has the convenience of having a collapsible frame. This means that you can fold your e-bike quickly and store it away, take it on the train with you or take it up to your apartment or office for added safety and convenience. It is made of top grade lightweight aluminum and features a 250W brushless gear motor, a 7 speed Shimano professional range transmission system which will provide you with the assistance you need to ride at a speed of up to 15 mph no matter the incline and the weather. The Hurbo e-bike offers premium quality shock absorption for your riding comfort and safety. It has strong front and rear disc brakes which you can trust to keep you safe and to enable you to stop in time, no matter what. Its front fork is made of carbon steel, and the wheels are double layered made of aluminum alloy. This superb electric bike can actually be used in two modes – as an e-bike or as a pedal assisted bicycle. This will allow you to choose when to travel without the need of pedaling or enjoy the PAS mode. The bike is sold with a bright LED headlight and with a meter with 3-speed smart buttons to pick your riding mode. The 36V 8AH lithium-ion battery has a mileage range of up to 15.5 miles, and is removable for easy charging via the included Easy Charge Port System. The Schwinn Sycamore e-bike is a brilliant all-around bike. You can use it for mountain biking, for commuting and traveling or for running errands. Your pedaling will be assisted by the 350W hub-drive motor, and you can choose the assistance power via the nifty thumbpad controller and the integrated large LCD display in the handlebar. You can pick to ride with up to 20mph with this e-bike by Schwinn. You don’t need to do any guesswork when it comes to the status of the battery, because the electric bike comes with a useful battery life indicator. Depending on the assistance level, you can expect to cover a range of 45 to 60 miles per full charge. The battery can be removed from the frame easily so you can take it with you to your home or office and recharge it. Also, you can rest assured that nobody will steal it if you leave it outside. The included charger is compact, so you can carry it with you when commuting to the office and you can easily charge the battery at home, in the garage or wherever you prefer. The Sycamore e-bike by Schwinn comes in several sizes suitable for people of all ages and body types. You can get a small, medium, large or extra-large version of this incredible e-bike. The bike features an 8-speed Shimano Alivo drivetrain, a Shimano Altus trigger shifter, as well as strong and reliable front and rear disc brakes. The frame of the e-bike is made of high-quality aluminum and flaunts an SR Suntour NEX suspension fork. Apart from the efficient front shocks which will make your ride as smooth as possible, the grips and the seat are extremely comfortable too. The Tomasar e-bike is one of the least expensive electric mountain folding bikes, and yet it has all the features you need in a good quality motor assisted bike. It is fitted with a 36V/8AH eco-friendly Li-ion battery which can take you to up to 15.5 miles in e-bike mode and up to 31 miles in assisted mode. Thanks to the smart battery charger, you can charge the battery for less than 6 hours. The Tomasar electric bike can be folded easily for convenient storage and portability so it is perfect for travels and trips. The frame is made of sturdy aluminum, and the bike has a 21 speed Shimano transmission. Thanks to the mechanical disc brakes, you can feel safe even during a downhill ride. The Tomasar is sold with a strong LED headlamp as well as a horn. It has 26-inch bead spoke wheels made of aluminum alloy. The tires are anti-slip and are wear resistant, suitable for snowy and wet conditions as well as for tough terrains. You can ride this affordable bike in either electric mode or pedal assisted mode. You can adjust the settings via the nifty control panel on the handlebar. This vintage electric bike not only looks amazing but it has some truly exceptional features as well. Thanks to the frame shape and the vintage LED headlight you will look like you are riding a café racer bike from the 1970s. The sports bicycle is powered by a 750W Bafang motor which can achieve a speed of up to 28mph. You can pick the perfect speed for your ride via the 7-speed gear by Shimano. The Tektro brakes will ensure that you stay safe no matter the terrain or the weather conditions. The e-bike has a 48V 13Ah Li-ion battery which can help you ride for up to 40 miles per charge. It is neatly stored in the specially designed “tank” on the frame of the bike. The frame is made of 100% top quality aluminum alloy, which allows it to carry a weight of up to 350 lbs. tire sports e-bike by Civi Bikes. 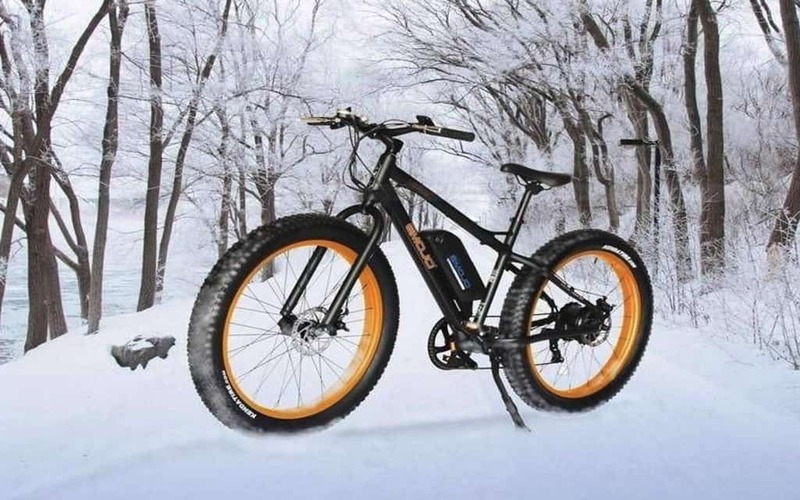 This electric bike is the ultimate all-terrain bike with 4-inch fat tires which you can ride on snow, in rain, on the beach, on gravel, on the ice, and wherever you choose to. It has a powerful 500W Bafang brushless motor and a small and portable 48V 10.4Ah Li-ion battery, so you can expect to ride for up to 50 miles with pedal assist and 21 miles in electric-only mode. The maximum speed is 28mph. You can take the battery with you wherever you go and can even charge it via its USB port from any other device, apart from using a standard electric power output. You can keep an eye on the battery level, as well as choose speed setting via the LED display. You can pick between low (5-9 mph), medium (10-15 mph) and high (25+ mph). This bike can be enjoyed in four different modes – as a regular bike, with pedal assist, as a throttle e-bike, or in combination mode where you can use the best of all riding modes. Hopefully, this top 5 list of the best electric bikes has helped you pick the best one for your needs and preferences. Whichever one you choose, you will be happy with the fun-filled riding experience which each of these e-bikes provides.